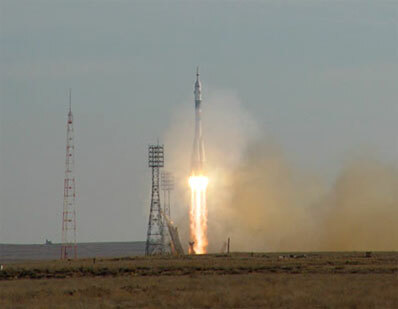 A Russian Soyuz rocket blasted off from the Baikonur Cosmodrome late Friday, boosting a fresh two-man crew - and history's third space tourist - into orbit for an Oct. 3 rendezvous and docking with the international space station. Under a partly cloudy sky, the Soyuz rocket roared to life at 11:54:53 p.m. EDT, quickly climbing away toward space atop a tongue of fire from its liquid engines. Nine minutes later, the spacecraft was in orbit. Its solar arrays and antennas deployed normally and the crew reported all systems were operating normally. On board were Expedition 12 commander Bill McArthur, flight engineer and Soyuz commander Valery Tokarev and U.S. businessman Greg Olsen, who paid the Russians some $20 million to visit the international space station. "Nowadays, everybody can fly every week," Olsen told reporters before launch. "The same will be true with space flight. There will be more tourists after me." If all goes well, Tokarev will oversee an automated docking with the space station's Pirs airlock module around 1:32 a.m. Monday. After hatch opening three hours later, the arriving spacemen will be welcomed aboard by Expedition 11 commander Sergei Krikalev and flight engineer John Phillips. Krikalev and Phillips, accompanied by Olsen, plan to return to Earth Oct. 10 for a touchdown in Kazahstan at 9:08 p.m. Landing will end a six-month stay aboard the orbital outpost. McArthur and Tokarev will remain in orbit until next March when they will be replaced by yet another two-man crew. McArthur originally hoped to return to Earth aboard a space shuttle. But because of on-going foam insulation problems, and delays caused by Hurricane Katrina, the next shuttle flight is now expected to slip into May at the earliest. In past years, this would not have been a major problem in and of itself. But a 1996 "balance" agreement that required the Russians to provide 11 Soyuz spacecraft to ferry joint U.S-Russian crews to and from the space station - at no cost to NASA - ended with Friday's launching. Enter the Iran Nonproliferation Act of 2000, intended to deter the transfer of advanced weaponry and nuclear technology to Iran. The primary target was Russia and section 6 of the INA bars NASA from buying space station-related products or services from the Russians unless the president determines Russia is actively working to prevent proliferation. Given NASA's current bind, an amendment to the INA is in the works, but as of this writing no changes have been approved and McArthur does not have a designated ride home.